ams has released the AS3956, a dynamic NFC sensor tag IC which meets industrial-grade quality standards and provides very high reliability in mission-critical applications and in products with a long operating lifetime. 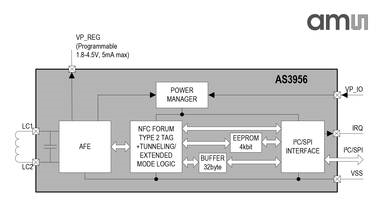 The AS3956 dynamic tag acts as a contactless bridge between sensors and any NFC reader, such as a smartphone, through a host microcontroller. It supports the NDEF messaging protocol in full compliance with NFC Forum recommendations, guaranteeing interoperability with any NFC phones, including Apple iOS devices. 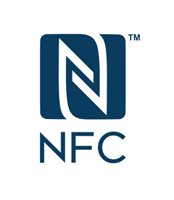 It includes various features that give the designer flexibility in implementing NFC-based applications. These include the provision of both an I2C and an SPI interface to a host microcontroller, and a wide supply voltage range of 1.65 V-5.5 V.
The AS3956 includes an energy-harvesting capability, drawing energy from the incoming RF field generated by an NFC reader, and supplying up to 5mA to an external device. Energy harvesting is particularly useful as a cost effective, small footprint alternative to standard wireless charging, to extend battery lifetime in biometric smart cards, or to implement fully passive wireless sensing solutions, as required for example in smart insulin pens. ams provides the AS3956 in a miniature chip-scale package (CSP) just 0.3mm high, and with a 1.8mm x 1.4mm footprint as well as in a 3mm x 3mm MLPD package. It is available for sampling now. Unit pricing is $0.53 in an order quantity of 1,000 units. For more information, click here.